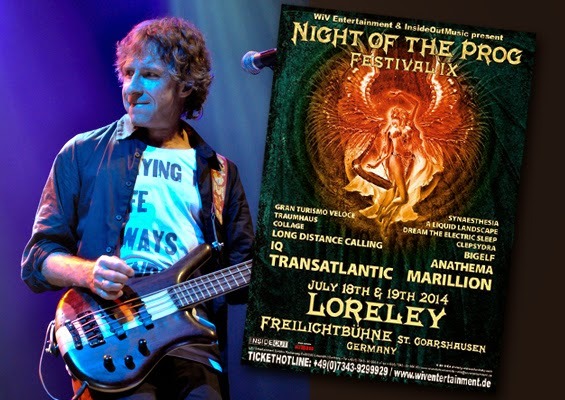 Framus & Warwick Artist Blog: Pete Trewavas Headlines Night of the Prog Festival! Pete Trewavas Headlines Night of the Prog Festival! Warwick Artist Pete Trewavas will headline the legendary german Night of the Prog Festival in St. Goarshausen, Germany. On Friday, July 18th, he will perform with the supergroup Transatlantic. Transatlantic is a multinational progressive rock supergroup consisting of Neal Morse (ex-Spock's Beard), Roine Stolt (The Flower Kings), and Mike Portnoy (ex-Dream Theater). On Saturday, July 19th, the crowning conclusion of the festival will be Marillion. They are known as the most successful band to emerge from the United Kingdom's 1980s neo-progressive rock scene. On both shows Pete relies on the Warwick Thumb bass and the WA 600 amp head + WCA 410 and WCA 115 cabinets.